Convolves front and back images with a kernel, and composites them using a matte. Convolution is a mathematical operator which uses one image, the kernel, as a filter shape for another image (the source). Convolution effectively stamps a copy of the kernel at each point of the source, using the source's brightness at that point. The effect is that a copy of the kernel will appear over all the bright spots of the source. A kernel image shaped like a circle or polygon will give an effect similar to RackDefocusComp; a kernel image shaped like a starburst can give something like GlareComp. The kernel size can vary between front and back so either or both can be blurred. Matte: Specifies the opacities of the Front clip. Only the red channel of this input is used. Kernel: The filter kernel or shape for the convolution. This should normally be all black around the edges (outside the specified Kernel Crop region), with a non-black central part. A larger shape normally produces blurrier results. Only the part of the kernel within the two Kernel Crop params is considered; the part outside that boundary is ignored. Size Front: Default: 1, Range: 0 or greater. Size Front resizes the kernel larger or smaller when convolving the Front clip. 1.0 is the original size. This parameter can be adjusted using the Size Front Widget. Size Back: Default: 0, Range: 0 or greater. Size Back resizes the kernel larger or smaller when convolving the Back clip. This parameter can be adjusted using the Size Back Widget. Size Rel X: Default: 1, Range: 0 or greater. Increase to make the kernel fatter or wider without changing its height. Decrease to shrink it horizontally, making it thinner. Size Rel Y: Default: 1, Range: 0 or greater. Increase to make the kernel taller without changing its wieght. Decrease to shrink it vertically, making it flatter. Kernel Center: X & Y, Default: [0 0], Range: any. The center point of the kernel; if you think of convolution as repeated stamping of the kernel at each point of the source, the center is where the stamp aligns with the source pixels it's stamped over. If you move the center to the right in the kernel, the whole result image will move to the left, and similarly up and down. This parameter is ignored if AutoCenter is on. It may be helpful to turn on Show Kernel while adjusting this parameter. Note that if Autocenter is off, the center point is always included in the kernel no matter what this param is set to. This parameter can be adjusted using the Kernel Center Widget. Automatically finds the center of the kernel image. Turning this on makes the effect ignore the Kernel Center parameter. Use Color Kernel: Check-box, Default: off. Use each color channel of the kernel independently. Turn this on if your kernel is not just black and white and you want the colors of the kernel to be used in the convolution. Turn off for fastest rendering. Autoscale: Popup menu, Default: Max Channel . In convolution, either a larger or brighter kernel will make the result image brighter. The kernel must be auto-scaled or normalized so the result is, on average, as bright as the input. The autoscaling can be done in several ways, each of which is best in certain circumstances. With a monochrome kernel or with Color Kernel turned off, Max Channel, Luma, and Indep Channels all give the same result. Max Channel: Autoscales the kernel by summing the elements of each channel, and using whichever is brightest as the overall kernel scale factor. This normalizes a dim kernel to full brightness, and generally preserves the color of the kernel, but allows brightness variations in the dimmer channels to show in the result. Luma: Autoscales the kernel by summing the luminances of each kernel pixel. This method preserves changes in the kernel's hue, but normalizes the luma, so a brighter or darker kernel will have no effect. Use the Scale parameter to adjust the result brightness. Indep Channels: Independently normalizes each color channel of the kernel. A colored kernel will give a white/gray result with this method. Use this method if your kernel channels are independent of each other (i.e. different things going on in each of R, G, and B) but you want normalized results in each channel. Count Nonzero: Count how many kernel pixels are nonzero (brighter than black), but otherwise ignore how bright they are. This method is best if you want variations in kernel hue and luma to show up in the result. But blurring the kernel will give a dimmer result, since there will be more nonzero pixels. Kernel Size: Ignore the pixel values entirely; only use the size of the kernel rectangle to auto-scale. Use this if you want all kernel variations to show up in the result, but don't use it if you intend to animate Kernel Crop1 and Crop2, as that would affect the result's brightness. 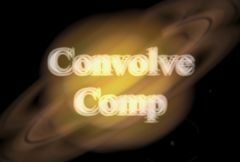 Combine: Popup menu, Default: Convolve Only . Determines how the front, back, and convolved images are combined. Screen: Composite the Front over the convolved back, then screen with the convolved front. Use this option for a glow or glare-like effect. Add: Composite the Front over the convolved back, then add the convolved front. Difference: Composite the Front over the convolved back, then show the difference with the convolved front. Front Threshold: Default: 0, Range: 0 or greater. In the Front clip, any source value below this will be treated as black. When combining the convolved result with the original, you can increase this value to only convolve bright areas of the source. Typically when using this parameter, you will also set Combine to Screen or Add to get a glare-like effect. This can be used to raise the threshold on a specific color and thereby reduce the convolved result generated on areas of the source clip containing that color. Values above 1 cause highlights in the source clip to keep their brightness after the convolution filter is applied. Matte Gamma: Default: 1, Range: 0.1 or greater. The gamma value to use for the defocus of the Matte. Front Brightness: Default: 1, Range: 0 or greater. Scale the brightness of the convolved Front clip. Front Opacity: Default: 1, Range: 0 to 1. Scale the opacity of the front clip before compositing over the back. Back Brightness: Default: 1, Range: 0 or greater. Scale the brightness of the convolved Back clip. Comp Premult: Check-box, Default: on. Show Kernel: Check-box, Default: off. Show the kernel over the result, for easier adjustment of kernel parameters. Turn this off for final rendering. Kernel Crop1 X: Default: 0, Range: any, Shared . With Kernel Crop1 Y, forms upper left corner of the kernel area. Parts of the kernel image outside the rectangle defined by Kernel Crop1 and Kernel Crop2 are assumed to be black. Making this area smaller to avoid processing the kernel's black edges can speed up the convolution somewhat. It may be helpful to turn on Show Kernel while adjusting this parameter. Note that if Autocenter is off, the center point is always included in the kernel no matter what this param is set to. Kernel Crop1 Y: Default: 0, Range: any, Shared . Upper left Y coord of kernel crop rect. Kernel Crop2 X: Default: 1e+04, Range: any, Shared . The lower right X corner of the kernel area; see Kernel Crop1. Kernel Crop2 Y: Default: 1e+04, Range: any, Shared . The lower right Y corner of the kernel area; see Kernel Crop1. Kernel Threshold: Default: 0.001, Range: 0 or greater. Any kernel value below this will be treated as black. It's important for the edges of the kernel image to be completely black, or the result will have a grayish cast to it. If your kernel image may have a little noise in the black areas, turn up threshold a little to remove that background noise. Clamp Below Threshold: Check-box, Default: on. When turned on, values below the threshold are clamped to zero. This usually gives the best result. For certain special cases with partially-negative kernels, turning this off gives you additional flexibility in designing your kernel. Edge Mode: X & Y, Popup menu, Default: [ BLACK BLACK ].